Lymphoma is simply defined as a type of cancer in the lymph system. British physician Thomas Hodgkin was the first to publish initial descriptions of the condition in 1832. The specific type of lymphoma he described (Hodgkin’s lymphoma) was appropriately named after him. After his initial description, many other studies looked at several other forms or types of the cancerous disease. A cancer appears when several of our bodies’ cells begin behaving abnormally. The body is comprised of various kinds of cells found in different organs like the nerves of blood. At times, normal cells cease getting usual biological signals that make them stop growing. When that happens, the cells abnormally continue to multiply and grow. This is the formation of cancer cells. When the cancer cells grow, the affected organ stops working normally. Several of the cancer cells also start to break off from the original site, spreading into many other body parts and affecting many other organs. The lymph system comprises an interconnected network with thin nodes and tubes carrying white blood cells. Such cells are responsible for fighting off infections. This way, they are vitally significant to the body’s overall well-being. When a lymphocyte (a specific kind of white blood cell) in the lymph system starts to become cancerous, it would tend to multiply and grow leading to formation of lymphoma. Which part of the body is usually affected by lymphoma? The cancer could affect any part of the lymph system. Usually, patients initially notice abnormal enlargement of the lymph nodes, specifically in the areas of the groin, the neck, and the armpits. However, lymphoma could also manifest in several other organs of the body. This is because minimal amounts of lymph tissue pass into practically every organ in the body as white blood cells reach out to different areas to perform control of infections. This type of cancer is currently the most usual form of blood cancer or hematological malignancy especially in the developed countries. Lymphoma comprises about 5.3% of overall forms of cancers in the United States alone. It comprises of up to 55.6% of blood cancers diagnosed. According to data released by the US National Institute of Health, Hodgkin’s lymphoma is accounting for about 1% of total cases of cancer across the country. Patients with HIV infection and exposure to certain medications and drugs have higher incidences of lymphoma for obvious reasons. Many forms of lymphoma are indolent (occurring lifelong even without medication or treatment) or aggressive (causing fast deterioration of health and eventually death). However, most incidences of aggressive lymphomas are responding ideally to treatment. In other words, they are curable. This condition is not a single type of cancer because it comprises of a group of several related forms of cancers. There are about 30 various types of identified lymphoma. In a broad sense, lymphoma could be categorized as either Hodgkin or Non-Hodgkin lymphoma. Of course, each type has its own features and manifestations and results to different outcomes in the long term. The symptoms of lymphoma are very common in many other sicknesses, which is why you really have to be vigilant about your condition and consult a doctor whenever you feel like there is something wrong. It may actually take some time before you realize that you have this kind of sickness because during the first few days or weeks, you may not even feel that something has changed. If in doubt, do not hesitate and set an appointment with your doctor before you conclude anything and start looking for treatments. These are the usual signs and symptoms of this kind of illness. Make sure that you don’t easily panic once you perceive that you have two or more of these, because as stated above, most of these are also common in other kinds of disorders. This is the most usual symptom. In many cases this is the only manifestation of lymphoma. The lumps are actually enlarged lymph nodes. Such lumps could be noticed or felt while you are changing or bathing. These enlarged lymph nodes are painless and you may never notice these if you will not inspect your body thoroughly. These enlarged nodes cause the other signs that are included in this list, but these nodes can also be present if you have other kinds of illnesses. Your partner could also call your attention because of such lumps. This top symptom must come with the following other symptoms to feed your suspicion that you may be suffering from this type of cancer. Weight loss that occurs rapidly and for no apparent reason could be suspicious. If you are not into any weight loss program and you significantly shed off pounds (about 10 lbs to 15 lbs in just several months), you should inspect your body and find out if there are lumps in the neck, groin, or armpits. If there are, immediately subject yourself to medical tests. You will easily notice such change if you already have a modest weight and you are not limiting your food intake neither you are exercising regularly. This will be harder to determine and conclude that it is already a symptom to a sickness if you are really trying to lose weight. In many cases, the weight loss occurs after you have lost appetite. This stage transpires when the illness has already grown and start spreading in your body. When you are starting to lose more than 10% of your ideal weight, you should be very concerned as to what is causing such and make sure that before your weight drop even lower, you have already sought the doctor’s help. When the nodes start to swell, you will experience fever that may last for some time. For example, for people who got what is called Hodgkin type of this illness, they will suffer from a fever that is referred to as Pel-Ebstein. Immediately seek medical attention if a fever occurs continuously and intermittently for a certain period of time. If there is no occurrence of urinary or chest infection and there are lumps in specific areas in the body, consult a doctor at once. Fever related to swellings of the nodes is commonly infectious. Many forms of lymphoma are usually mistaken as mere infections during the early stage of cancer. Pel-Ebstein fever (very high fever going on and off for seven to 10 days) is a top manifestation of Hodgkin lymphoma. Some people experience excessive sweating at night. This situation is quite bothersome. It is uncomfortable. Often, you may wake up in the middle of the night while being drenched in too much sweat. When there is no apparent reason for this sweating episode and other symptoms of the cancer are evident, you should be alarmed. The cells that are infected with the disease secrete special chemicals that cause itchiness that will affect your whole body. You would experience an unexplained and considerable loss of appetite if the lymphoma has spread across other parts of the body. This leads to weight loss, which is discussed earlier. If you detect a 10% weight loss or more, be immediately concerned as the symptom could already be a poor prognostic factor of the cancer. At the same time, there could be abnormal itchiness all over the body as lymphoma cells secrete special chemicals due to the condition. Lastly, lymphoma comes with an overall feeling of weakness. As cancer cells continue growing, they inevitably make use of most of the nutrients in the body. This occurrence makes you logically feel weaker. This can actually take place in any organ of the body and as the cancer cells grow bigger, the person who has this will feel weaker because the infected areas use more of the nutrients inside the body. There are other unusual symptoms that can be felt by people who are suffering from lymphoma, depending on where the sickness occurred. There are two main types of lymphoma. The most common one is the Hodgkin's lymphoma. This type is distinguished from the rest by the presence of the Reed-Sternberg cell. The spread of the cancer cells in Hodgkin's lymphoma is more predictable and often quite limited unlike the non-Hodgkin's lymphomas where cancer cells develop first in other organs before spreading into the lymph nodes. The non-Hodgkin’s types of lymphomas are classified according low-grade, intermediate-grade or high-grade lymphomas which basically is based on how quickly the cancer cells spread. Lymphoma is the type of cancer that usually targets all or specific parts of the lymph system. This is composed of network thin tubes and nodes that are interconnected and makes possible for the white blood cells to be carried. Lymphomas are cancers of the lymph system which ironically is part of the body’s defense mechanism to fight off infections and diseases. But sometimes the abnormal growth of the healthy lymphatic cells causes the tissues to mass up creating tumors and eventually becoming cancer cells. Experts say that these cells play a very important role in any individual's well being because it is responsible for fighting infections in the body. When a "lymphocyte" which refers to a type of white blood cell that composes a part of the lymph system has cancer cells, this cancerous cell is expected to grow in number. Once it has multiplied, this results to what we call "lymphoma." Experts say that lymphoma does not only refer to a "single cancer" but it's also synonymous to a group of many cancers that are connected. Currently, there are over 25 types of lymphoma but are categorized into two—the Hodgkin Disease and Non-Hodgkin Lymphoma. Both may have the similar symptoms, thus, same sets of tests and diagnoses could be done. However, the differences in these two types are evident depending on the way the body of the person affected reacts. Aside from Hodgkin Disease and Non-Hodgkin Lymphoma, other types of lymphoma include the "Mantle Cell Lymphoma," "Malt Lymphoma," "Cutaneous (Skin) Lymphoma," "Diffuse Large B-Cell Lymphoma," "Burkitt Lymphoma," and the "primary CNS Lymphoma," among others. If left untreated, the cancer cells can easily break away from the tissues and begin infecting other parts of the lymphatic system and eventually moving to other organs of the body. There are essentially two kinds of lymphomas, the Hodgkin’s lymphoma and non-Hodgkin’s lymphoma. Hodgkin’s lymphoma is characterized by the presence of Reed-Sternberg cells. 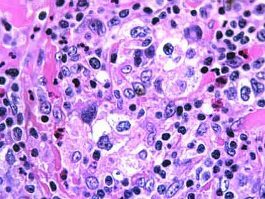 Other lymphomas do not contain these cells so the rest of the lymphomas were classified as non-Hodgkin's lymphoma or NHL. There are a number of sub-types of non-Hodgkin's lymphoma. Each are quite distinct targeting specific age groups aside from having unique forms. One kind of NHL is the lymphoblastic lymphoma or LBL which commonly occurs in children. In fact about 30% of documented cases of lymphomas in children have been classified as lymphoblastic lymphomas. LBL is very aggressive kind of NHL and has caused quite a number of deaths in the past. But because of modern medicine and treatment techniques, LBL patients have better odds of surviving the ordeal. Unlike LBL, the diffuse histiocytic lymphoma type or DHL is a slow growing cancer. And because it is slow-growing the cancer is quite hard to detect. Also, there are times where the cancer reappears after treatment. Another kind of NHL appears closer to the body’s surface. The cutaneous T-cell lymphoma or CTLC is a kind of lymphoma that affects the skin. What happens is that the white blood cells of the skin become cancerous. At first, the signs are dry, scaly skin with red or dark patches. These areas of the skin also itch a lot. But as the cancer cells continue to grow, the skin will develop highly noticeable tumors. Eventually the cancer cells enter the blood stream and spreads all over the body which soon infects other tissues and organs. Although not common, the mantle cell lymphoma is another kind of non-Hodgkin's lymphoma. This cancer borders on being rare since only an estimated 5% of people diagnosed with NHL have it. It seems that the cancer is more likely to occur in men 50 years old and older. The cancer starts off as a slow growing lymphoma but can suddenly become aggressive in later stages. Doctors have made 4 classifications or stages of non-Hodgkin's lymphoma which basically indicates how fast and how far the cancer cells have spread. Stage 1 is when the cancer cells are grouped in lymph node or organ of the body. In stage 2 the cancer has spread to two or more groups of lymph nodes or organs on the same side of your diaphragm. Stage 3 is where the cancer cells have infected organs on both sides of the diaphragm and finally stage 4 is when the different types of non-Hodgkin’s lymphoma have gone beyond the lymphatic system and infecting other organs like the liver, bones, and lungs. Contrary to its name and to what some people might have told you, lymphoma is not just isolated on the lymph nodes and thymus gland for the lymph or lymphatic system is actually composed of the bone marrow, the thymus gland, the lymph nodes, tonsils, appendix and spleen. The system filters the waste or unwanted materials like fats and bacteria from the various body tissues. The one that picks up the body’s dirt is the lymph, a clear or sometimes yellowish fluid. Despite the thousands of hours spent on medical research and laboratory testing the actual cause of the disease is still an unknown. DNA mutation is one of the possible cause of why lymphoma develops but what happens why DNA have to mutate remains a big question to the medical science community. Medical scientists, nevertheless, have found several factors that can possibly increase the risks of developing lymphoma. As you might have already guessed, the two general factors are genetic and environmental factors. Genetics for one is still a complicated issue that most likely cannot be resolved soon with a concluding answer. Inheriting the disease cannot still be ascertained as a valid cause. However, it was found out the people with inherited immune disorders are most likely to develop lymphoma as well. Immune disorders such as lupus, rheumatoid arthritis and celiac disease appear to have a hand in the development of lymphoma. Likewise, those that have immune system disorders are also at a higher risk of developing lymphoma. Those that belong to this type of disorders include patients with HIV/AIDS, Helicobacter Pylori and Epstein-Barr virus (EBV). People with compromised immune systems like those with HIV/AIDS and EBV are often candidates for lymphoma as well. On the environmental factors side, it should be common knowledge by now that various health hazards such as exposure to chemicals and radiation causes a variety of diseases, disorders or health conditions. And this includes developing lymphoma. More specifically, solvents like acetone, alcohol (yes various alcohols), xylene, turpentine, and benzene have found to associated with lymphoma. The same can be said with chemical herbicides and pesticides which make farmers and various workers in the agricultural sector at a higher risk on developing the disease. Some hair dye products have also been found to be a significant factor to the development of lymphoma in some patients. Although, it seems that the hair dye products that shown such effects were those manufactured before the 1980s. These are some facts according to the Leukemia & Lymphoma Society: 19.5 out of every 100,000 people in the world develop Non-Hodgkin’s Lymphoma while 2.8 out of every 100,000 people in the world are diagnosed with Hodgkin’s disease. Hodgkin’s disease and Non-Hodgkin’s Lymphoma are two of the main classifications of lymphoma, a cancer of the body’s lymph system. According to studies, Hodgkin’s lymphoma is more likely to develop in young adolescents particularly those within the age range of 15 to 24 as well as those who are more than 60 years old. Again this is quite different from non-Hodgkin’s lymphoma which rarely happens in young people and instead is more common to people aged 60 years old and above. Experts say that aside from being unfamiliar with signs and symptoms of lymphoma, this condition can be hard to notice because the usual signs can be quite common. Some may even be mistaken for common ailments such as fever and even colds. But if you are one of those that are at risk—somebody who have cancer history in their families or those that have weak immune system that are prone to infections—it would be best to have an appointment with your doctor. Although there are some preventive measures that are advertised to prevent cancer cells from growing, nothing can stop it fully once it has multiplied and disabled the function of specific organs in the body. Doctors and scientists have yet to identify the singular cause of the cancer. However, what they were able to do was identify the different risk factors involve that might affect the development of lymphoma. It seems that prolong exposure to hazardous chemicals, herbicides, pesticides and even drugs that suppress the body’s immune system have been tied to the high chances of developing cancer of the lymphatic system. Avoiding these situations would be a good life choice or at the very least if you work in the industry where handling chemicals or pesticides are necessary you should take the necessary precautions to protect our bodies from harm. Upon consultation, your doctor will issue a battery of tests to confirm if it is lymphoma and if it is indeed cancer determine what stage it is at to know the possible course of treatment. A biopsy is usually the first test that your doctors will employ to confirm the presence of cancer in your lymph nodes. In a biopsy, a small sample of tissue cells is taken from the lump either through a needle or via surgery. The cells are then examined by a pathologist to confirm lymphoma cells and the diagnoses. By studying the sample cells, the can also determine the basic kind of lymphoma the patient has, whether it’s Hodgkin or Non-Hodgkin lymphoma. But to determine the subtle details, doctors revert to the procedure called as immunohistochemistry which simply means looking for the unique properties of the tumor cell surface through the application markers such as fluorescent dye, enzyme, or colloidal gold to accurately classify the tumor. You doctor would most likely require you to undergo several blood tests. The blood samples would be examined closely to see the state of your red blood cells, white blood cells and blood platelets. These tests would also help determine if the cancer has affected your body’s way of producing blood. The blood tests could also show the condition of your kidneys and liver. And more importantly, the information gathered from the tests could serve as basic foundations for the kind of treatments or drugs that could be used for your speedy recovery. Doctors might also require you to undergo a bone marrow test wherein a sample of the bone marrow is taken from your hip using a thin needle. It is a common procedure used to test for various cancers and other blood diseases. A spinal tap or lumbar puncture can also be ordered by your doctor in specific circumstances. This checks the fluid in your spinal cord and determines if any cancer cells have invaded the spine. This procedure involves inserting a thin needle at the lower part of your back and I can be quite painful and uncomfortable. CT scans will also help determine where the tumors are exactly since it takes pictures of your body from different angles. An MRI scan, on the hand, will help determine if the cancer cells have spread to your nervous system or other body organs. Among the usual tests your doctors would require you to undertake includes blood tests to check abnormalities in the blood counts, blood chemistry, and abnormal erythrocyte sedimentation rate (ESR), X-rays to look at the lymph nodes, computerized tomography or CT scan and magnetic resonance imaging or MRI scans of the chest, pelvis, and abdomen to see if the cancer has already spread to other parts of the body. Other scans that could be used to properly diagnose and determine the stage of the cancer are the positron emission tomography or PET scan which scans the cancer at a cellular level and the gallium scan which looks for radioactive intake of gallium which can mean the onset of the disease. There are other tests and procedures which doctors might conduct on you all in the aid of a proper and accurate diagnosis. Lymphoma, once detected, should be immediately and accordingly treated. Remember to take medical treatment as per your doctor’s advice. There are many options available, as mentioned, but there are several that usually stand out. There are four major types of lymphoma treatment available, namely, chemotherapy, radiotherapy, stem cell or bone marrow transplant, and antibody therapy. Chemotherapy involves the administration or application of drugs as infusions into the veins of the patients. Chemotherapy could also be taken in the form of oral pills. The most common types of chemotherapy for lymphoma are R-CHOP, CHOP, and ABVD. On the other hand, radiotherapy uses high-energy light rays that are specially and strategically directed at the cancer cells targeted. This form of therapy could be delivered even over small body areas as in involved field radiation or over large areas as in extended field radiation. Stem cell or bone marrow transplant uses high dosage of radiation or chemotherapy to specifically kill targeted cancer cells. The bone marrow is saved during the process through transplantation of a new one or through transplantation of stem cells. Lastly, antibody therapy, also known as biological therapy, uses specific drugs to target special molecules across the cancer cells’ surfaces. There are almost 25 various kinds of non-Hodgkin’s lymphoma (NHL). Several of them behave differently compared to others. Treatment used depends on the specific type as well as observable behavior of the NHL. Chemotherapy is the most popular. Antibody therapy and/or radiation therapy may only be added to complement chemotherapy for additional benefits. Because of the number of types of lymphomas, the treatments vary. Often the treatments are combinations of various therapies and procedures. It is normal to have a number of treatments for a single lymphoma case. Once the type of lymphoma has been diagnosed and identified, the next step is to determine what stage it is in now. The kinds and extent of treatment of the cancer is dependent on the age of the patient and the degree or stage of the lymphoma. The treatment methods are either through chemotherapy, radiation therapy, antibody therapy (or biological therapy) and bone-marrow or stem cell transplantation. Again, combining one or two of these treatment methods is possible to address the present condition of a patient. Chemotherapy uses various drugs to kill the tumor or cancer cells. The drugs can be taken orally or through injection. The advantage of using chemotherapy is that the drugs do not cause that much damage to the nearby normal and healthy cells. Radiotherapy, on the other hand, uses X-rays to kill the tumor cells. The rays damage the DNA of the cancer cells and because the DNA is damaged the cancer cells are unable to multiply which halts that growth of the cancer. Nearby healthy cells are damaged from the radiation bombardment so the goal in radiotherapy is minimize the damage to nearby, healthy cells. That is why those who undergo radiotherapy is scheduled to receive small doses of radiation at a time to lessen the damage to the cells. Another treatment is the antibody therapy which uses antibodies which target unique molecules of a cancer cell. This attack from the antibody will eventually kill the cancer cells. And finally, the last way of treating lymphoma is by bone marrow or stem cell transplantations. These are medical procedures where the stem cells that were destroyed by high doses of chemotherapy and/or radiotherapy are replaced through surgery. Like other cancers, lymphoma can be treated with chemotherapy and radiotherapy among with other methods like antibody treatment and even through bone marrow transplants. And just like any other type of cancer, there are some notable side effects of lymphoma treatments. Treating cancer is rather toxic to the body. Cancer cells multiply in an abnormal rate. This rate of growth produces a mass of tissue which becomes a tumor. When left alone the cancer cells eventually suffocate the healthy cells nearby and shut down their functions. Whole organs can shut down completely which obviously means death to that person. Eradicating these cancer cells is the key element in cancer treatment procedures. However, the overall goal of cancer treatments is to destroy cancer cells without killing the normal and healthy cells nearby. Chemotherapy is a common method of killing those cancer cells. This treatment uses various drugs to eliminate the cells. However, the drugs still affect some of the healthy cells. Among the more common side effects of the treatment in lymphoma patients includes decreased blood cell production, diarrhea, fatigue, mouth sores and hair loss. Decreased in blood production includes the normal red blood cells, the white blood cells and even the platelets. Some patients also reported feelings of nausea after the treatment. And because the drugs used for the treatment can also harm the production of sperm and egg cells, it is a medical fact that the treatment can indeed cause temporary or even permanent sterility of patients. Instead of drugs, radiation therapy uses x-rays to kill the cells. But just like chemotherapy, the use of high energy x-rays can kill the neighboring healthy cells. Common side effects of this treatment include feeling tired all the time like all your energy was drained out of your body. Hair loss and nausea are also common problems when patients undergo radiation therapy. But hair loss is limited to areas where the treatment is actually targeted. Nausea and skin changes like getting red or itching are other known side effects. Some treatments use steroids to control the growth of the cells. This is actually quite common and is used alongside other treatments. Steroids such as cortisone, prednisone and dexamethasone can cause insomnia, increased appetite, mood swings or changes and weight gain. The good thing about steroid treatment is that it is not used for long periods so the side effects are actually not strongly felt. To counteract the side effects of lymphoma treatment, doctors suggests that you drink a lot of water before your treatment especially if you will undergo chemotherapy. If you experience mouth sores, a good way to provide some comfort is by drinking milk and cream. Juices especially tomato and citrus juices are not a good idea when you have numerous sores in your mouth. It has been suggested that you eat several small meal portions during the day instead of eating full size meals. Remember that your immune system at this point is compromised because of your low blood count so it would be advisable to stay away from crowded areas and people that are sick. Ask your doctors for other ways to lessen the side effects. Conditions such as lymphoma, the cancer in the lymph system, can be depressing. This is because you have to undergo painful treatment options such as chemotherapy and radiation in order to get better. Aside from that, you will have to spend money for hospitalization, continues medication and regular check ups. All these are the common problems people with illnesses and their families have to deal with. It's painful and stressful but then, there's no gain if you give in to self-pity and depression. Those negative feelings will only make you feel bad instead of helping your recovery. Experts say that the most common issues that people who are suffering from lymphoma deal with would include the side-effects of lymphoma treatment, the total cure and possible relapse as well as fertility issues—both in men and women—after cancer treatment is over or while it is still being administered. These issues might be hard to deal with but experts suggest that these could be handled so much better if one tries to see the brighter side of the situation. If one is able to see the good after surviving the condition, then living with lymphoma would be so much easier. If you are one of those who would want to get started on recovery of the soul and the body after a lymphoma treatment, the first thing that you need to set your mind into it. If your mindset is that you would want to get started on recovery and stick with it until you are successful, you will be inspired to aim for that goal. Setting your mind into something will help you look forward to the results of what you are aiming for. For people, who have just survived lymphoma, to have a proper mindset, he or she clear their minds from negative thoughts. Once a clear mind is achieved, that person would be more enthusiastic when it comes to recovery. The next best thing is to start over again. This time, there should be no pressure in the recovery and this can be done if you would start accomplishing small and simple tasks. If you start, you would be able to recover fast enough without having constant worries of relapse hanging over your head. Another thing that can help you pave the way for recovery and healing is when your get started learning new things. Patients who have just recovered from terminal illnesses such as lymphoma are encouraged to start anew so they would be able to face the life ahead of them. Patients are asked to spend some time in acquiring new skills that can help them achieve the goals they have set for themselves. Experts agree that having the concept for recovery is a very important factor for people who are trying their best to live with lymphoma. Acceptance when it comes to the things that one and could not do will also help the faster recovery not only of the body but also of the mind and the soul. When a person is diagnosed with a condition known as lymphoma, his life should evolve in more than just having laboratory tests and deciding what treatment to take. During the entire course of the treatment and several years following its completion, there are many other issues that would come and go, like coping with side effects from treatments, possible remission and relapse, understanding the concepts of disease response, and arranging for necessary funding for the treatment. The immediate family of the patient should also readily provide support in any form other than financial. The issues should be immediately understood and addressed. Remember that lymphoma treatment could be long and very complicated. Every type of treatment (radiation, chemotherapy, stem cell transplantation, and antibodies) could bring about its own complications and issues. There are known side effects of taking such lymphoma treatments. They include hair loss, fatigue, weakness, loss of appetite, sore mouth, and sore skin. Red blood and white blood count could also fall as such cells could also be killed along with cancer cells during treatment. In some cases, there is nausea, vomiting, and difficulty or pain in swallowing and drinking. For the financial aspect, understand that lymphoma treatment could be significantly expensive. Several treatments and drugs may be covered under health insurances and government grants but still overall costs could be high. The patient could opt to take financial aid from the government specifically granted to cancer patients. There are even non-government organizations that provide financial support to lymphoma and other cancer patients. The patient should understand treatment response as well as survival. When treatment is completed, the doctors should immediately assess treatment response. Once all diseases seem to have already disappeared, the patient has had a complete response. He is in a stage of remission. When the disease reappears in the future, there is a condition called a relapse. The patient should very well understand the possibility for both remission and relapse. The doctor should explain each very carefully to the patient. There are issues following the lymphoma treatment. Patients who win the initial battle against the disease should still expect significant issues in the coming years. Lymphoma and the treatments used have long-term effects. And because the drugs used for the treatment can also harm the production of sperm and egg cells, it is a medical fact that the treatment can indeed cause temporary or even permanent sterility of patients. The survivor’s battle is not yet over after complete recovery. In the coming years after the treatment, these could still be expected: cancer-related fatigue, infertility, memory problems, and possible heart damages. Lastly, the lymphoma patient should not feel alone. The patient needs to feel that his battle against the disease is not fought by him alone. Moral and emotional support could be important. The family members and the loved ones of the patient could take significant roles in supporting the affected individual. Some people fail to recognize the fact that recovery from lymphoma goes beyond mere monetary expenses. Physical recovery from the disease should be complemented by emotional and mental recovery. In this aspect, making the patient feel loved and supported by people around him would definitely help. Home remedies could also be tried to cure this disease, especially after early detection. Such remedies should only be considered as secondary only to medical treatments against lymphoma. The best natural remedy is to strategically detoxify your body. To do so, you have to drink lots of water and fruit juices. There are foods that enhance the detoxification process like carrots, beets, mushrooms, and broccoli. During the process strictly avoid consumption of sugars, saturated fats, and refined foods. Fruits and vegetables could be best as natural treatments against lymphoma. These include pears, apples, parsley, and lettuce. These foods detoxify the body as well and at the same time aid quick cleansing of your body’s lymphatic system. Chinese herbs like codonopsis and ginseng could also be tried. Further reading through our articles on Lymphoma health issues will give you a body of information that will help you decide what options you have to deal with the underlying causes of your problem through giving your body the nutrition products that will assist you body to heal from the inside out. We wish you well in your search for solutions to this Lymphoma problem and your movement towards better health in all areas. The resources on this your health online site are not intended to be a substitute for professional advice. While all attempts have been made to verify information provided in this publication, neither the author nor the publisher assumes any responsibility for errors, omissions or contrary interpretation of the web site subject matter herein. The what is your health online site \contents are solely the opinion of the authors and should not be considered as a form of advice, direction and/or recommendation of any kind. If expert advice or counseling is needed, services of a competent professional should be sought. The what is author and the Publisher assume no responsibility or liability and specifically disclaim any warranty, express or implied for any products or services mentioned, or any techniques or practices described.